Scooper - Technology News: The number of people aged over 60 is set to double by 2050. Are we prepared? The number of people aged over 60 is set to double by 2050. Are we prepared? By 2020, individuals aged 60 and older will be greater in number than children younger than five. 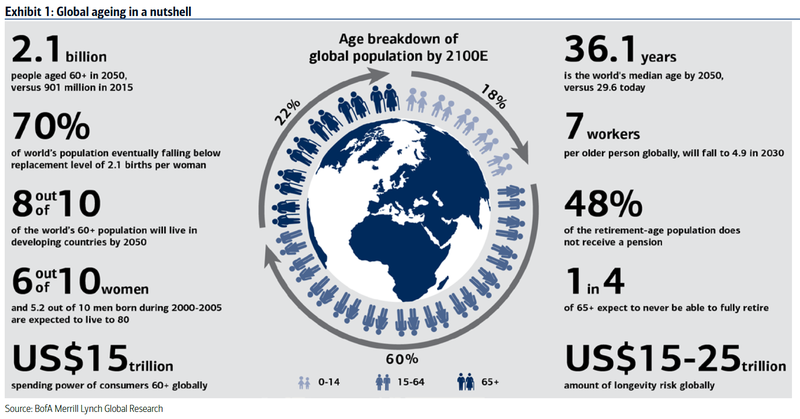 By 2050, the world’s older adult population will have doubled to 2 billion. These numbers are striking. Cognitive decline, strained pension schemes, and burgeoning healthcare costs: are we prepared for tomorrow’s complex longevity challenges? These challenges provide unique opportunities and considerable threats if we fail to act soon. Governments and insurers monetize health and have a direct interest in actively promoting longevity. But they are not alone. All sectors and stakeholders have a role to play in enabling progress toward the creation of healthy and vibrant older societies. Financial services organizations – particularly banks and insurers – have a fiduciary duty to uphold for their customers. Financial protection is needed for preventing financial abuse of the elderly. Technologies predicted by the Fourth Industrial Revolution – ranging from wearables and in-home sensors to artificial intelligence and advanced algorithms – can support the health and wealth of older adults. Regulations and policies must accompany these technological advancements. A growing number of academics and businesses are examining the impacts of health and wealth together. Skills in financial reasoning are among the first to erode with cognitive changes to the brain. Training professionals in cognitive impairment and ageing are needed to support better communication across a majority of institutions. Physicians should be trained and encouraged to discuss financial and personal affairs with their patients. The value of activities undertaken to promote health and wealth in early life become increasingly apparent in later life. Financial planners must work with their clients to develop financial plans that address the effects of cognitive decline across the life course. Urban planners must build housing, transport, and entire cities for an ageing global population. Research is needed to better bridge the divide between health and wealth. For healthy ageing, additional research is needed on the determinants of longevity and its most effective interventions. For wealth, predictors and patterns of financial abuse and fraud is required. Academic researchers and financial institutions must collaborate to generate cross-cutting research on healthy ageing and financial wellbeing. Personalized technologies with the potential to facilitate healthy ageing and the prevention of financial fraud among older adults are gradually emerging. These technologies must be developed for ease-of-use and functionality, while maintaining appropriate safeguards on data protection and privacy. Artificial intelligence and robotics will be enablers of enhanced function and protection, though they will require collective action to ensure their widespread benefits. The regulatory and policy environment needs to be adapted for ageing populations. This may include modifications to caregiver oversight and power of attorney statutes that serve to prevent financial fraud and abuse. Granting access to third-parties, including caregivers, must become the new norm in a world of ageing populations. These recommendations are inspirational and ambitious. They cannot be fulfilled by one individual or organization acting alone. It will demand the deliberate foresight and collaboration among diverse stakeholders to facilitate the creation of sustained health and wealth for older adults. They will take cooperation and dedication, though the results are worth the investment. Acknowledgments: The author would like to thank Gillian Christie and Dominic Lee, who have been instrumental in the development of both reports and this article.